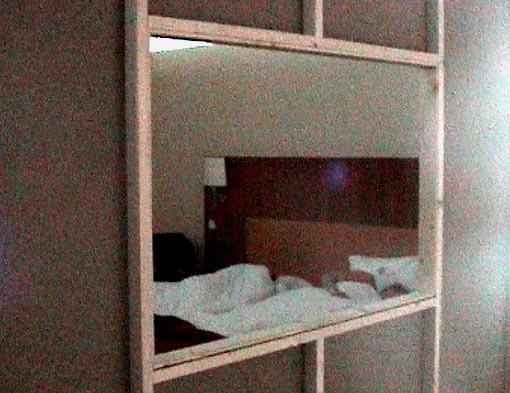 ‘Sleeping in Art’ has been one of the striking elements of the Motel Mozaïque interdisciplinary festival in Rotterdam right from the start in 2001. During the 2004 event, held on the weekend of April 16-18, the Gemeentehotel by design firm Schie 2.0 was the place to stay. After an unsuccessful attempt to secure the use of a vacant property in the centre of Rotterdam, the Gemeentehotel eventually found its home on the first floor of Las Palmas. For two days and nights the big open floor of the former warehouse became a hotel. Everywhere you looked beds of all sorts and sizes were arranged in dormitory-style rows, in circles or in higgledy-piggledy formations. Among the beds stood two ‘rooms’, one furnished by the Bilderberg-Parkhotel with a king-size bed, red carpet and a seat, while the other had the standard minimum dimensions of a hotel room. There were also two tents, a temporary sleeping unit by Tobias Lehman, a ‘lampshade’ bed by Joost van Alphen, and a bedroom in dark oak by De Opslag. As guests checked in they had to play a lottery by choosing a number without knowing which was the corresponding bed. No doubt the most appealing prize was the Bilderberg king-size bed with champagne breakfast. But a Red Cross bed in one of the rows, complete with anti-hangover mixture the following morning, had its own charm too of course. Anyone who wants to ‘sleep in art’ next year will have to move fast. The 1-5-star Gemeentehotel by Motel Mozaïque was fully booked out well in advance of the festival weekend. Motel Mozaïque, born during Rotterdam Cultural Capital 2001, is organised every year by Nighttown (pop concert hall), the Rotterdam City Theatre and TENT. Centre for visual arts. The event comprises a colourful programme of music, performances and art. In 2001 TENT. offered festival visitors a room for the night, in sleeping quarters furnished by artists. Festival visitors could spend the night in sleeping capsules by Bik van der Pol, or in a women’s communal bed by Joep van Lieshout. This year TENT. wanted to shift the focus to the exhibition ‘Sons & Dottirs’, featuring work by Icelandic artists, and a music program by the VPRO’s 3voor12. The search was for a new solution to the sleeping question, and Schie 2.0 was asked to come up with an idea. Their answer was the Gemeentehotel (‘City Hotel’), the ‘welcoming, public sleeping area in Rotterdam’, intended not only for festival visitors but also for the homeless, tourists and refugees – in fact, for everyone who sometimes needs a roof over their heads. The Gemeentehotel was Schie’s reaction to the ‘increasingly repressive ‘gated-community’ policy pursued by Rotterdam city council, which is detrimental to the urban dynamism of the city’. The hotel was a reaction to the way city authorities are trying to ‘clean up’ the public domain and confine each function a more-or-less designated area. In the hotel, by contrast, everything was jumbled up together in one big open space used for sleeping, eating and entertaining. Apart from offering shelter to all kinds of guests, the hotel came about thanks to the support of a host of organisations and individuals. Beds were provided by the Red Cross, generous Rotterdammers, and the Bilderberg-Parkhotel. Breakfast was served by the Hilton Hotel, the youth wing of the Socialist Party, the Sailors’ Home, the African Association and also by generous Rotterdammers.